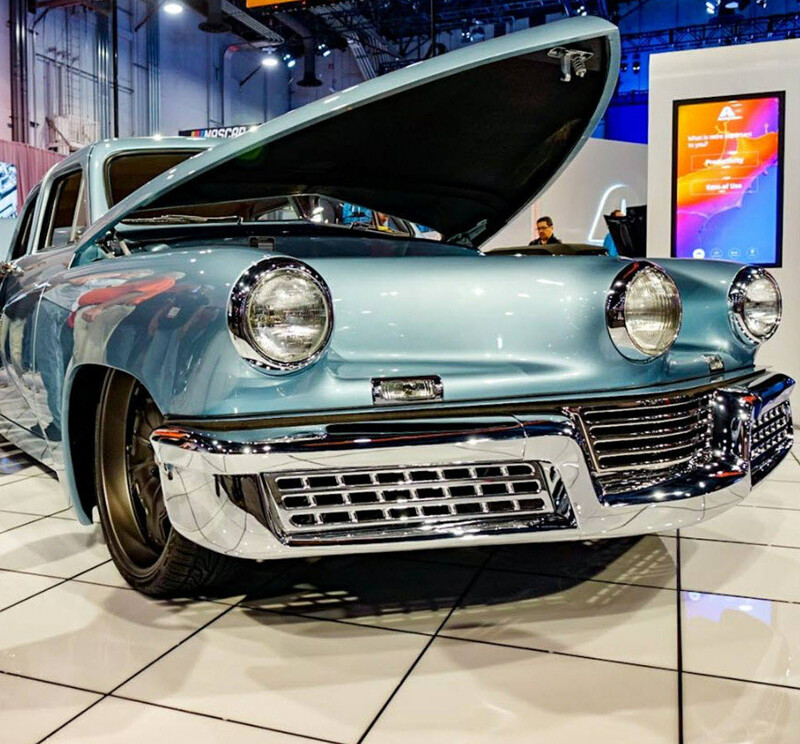 Mike Austin reports on Rob Ida's "new Tucker" that was exhibited this week at the 2017 Specialty Equipment Market Association (SEMA) show in Las Vegas. Tucker '48 #1044 received a shout-out in the article. You can't go out and buy a Tucker 48. Not really, at least. First, you’d need to find one of the 47 (depending on how you count) surviving cars, many of which are in museums. When Tuckers do show up for sale, like this one at RM Sotheby’s in January 2017, they go for more than a million dollars. If you’re Rob Ida, however, you can just build one of your own. Ida’s obsession with the car is a family affair. “I have a real personal connection,” he says. His grandfather signed up to be an original Tucker dealer. Rob’s father, Bob, a hot rod builder himself, grew up on what-if tales of Tucker’s potential. That led the father and son team to build a faithful replica in 2001. Ida Automotive has since built three more cars; the newest is making its public debut at the 2017 Specialty Equipment Market Association (SEMA) show in Las Vegas. The SEMA show is a sensory overload of automotive excess. Countless cars, which took thousands of hours and thousands of dollars to build, blend into an endless backdrop of glossy paint and shiny chrome. Ida’s Tucker, however stands out as a thing of automotive post-war beauty. The carbon fiber and steel panels that form Ida’s Tucker are an exact copy of the original. 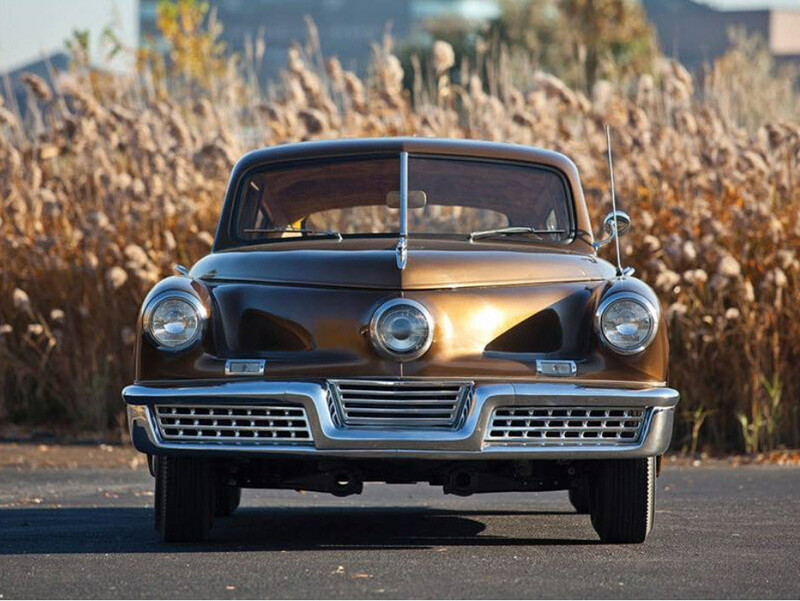 A Tucker owner near Ida’s Morganville, N.J., shop allowed him to take measurements of every contour. The air intakes on the rear fenders are cast from original molds that Ida borrowed. But the latest version is a step beyond the classic resto-mod. The new car closely replicates the 1948 car on the inside and as the outside, unlike Ida's third Tucker from 2007, which has a retro-modern dash complete with a stereo receiver. Without a 1948 Tucker as reference, most people wouldn’t notice any differences. The transmission control to the right of the steering wheel even works. In the original Tucker, the lever was used to pre-select the next gear, which would engage when the driver pressed the clutch pedal. Ida’s car uses an automatic transmission, but the pre-selector still chooses the gear, and the clutch works an electronic switch to activate the shift. The “lollipop” levers on the left side of the dash control heating and ventilation on the original Tucker; on Ida’s car they control the air suspension. Ida’s Tucker is now a family affair as well, built with the assistance of Sean and Mike Tucker, great-grandsons of Preston Tucker. Sean is an engineer by trade, and he took part in designing the exhaust and turbo system on the new car. He also made the interior door-release buttons using 3D printing. Sean explains that when the Tucker Corporation originally went under, everything was sold. 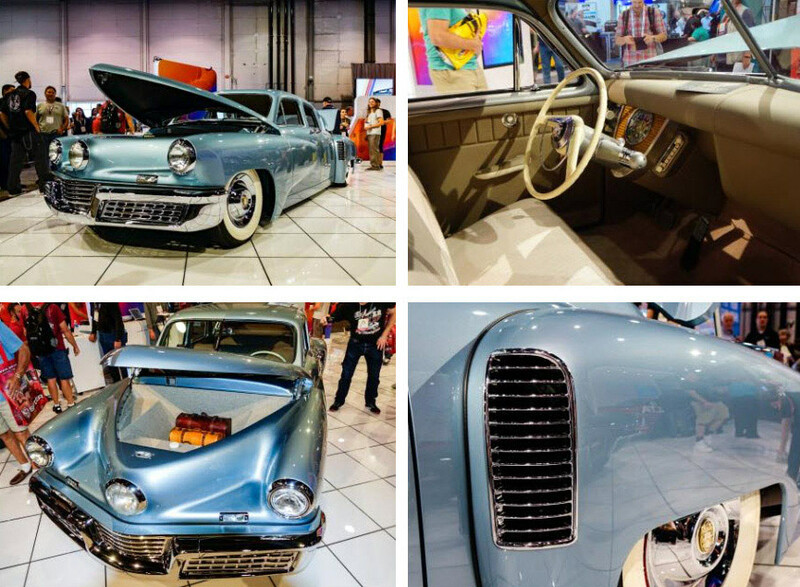 Over the years, he and his brother worked to buy back as many trademarks and assets as they could, and in 2012 formed Preston Tucker LLC to preserve the business side of the Tucker heritage. There is one major departure from history on Ida’s Tucker, and that is the engine location. The Tucker 48 famously housed its engine in the trunk, to keep the mass of the engine from intruding on the passenger cabin in a crash. But hanging mass behind the rear axle can create problems. “When you have a rear engine and 128-inch wheelbase,” Ida explains, “it makes for less-than-ideal handling.” Thus, Ida mounts a twin-turbo Cadillac Northstar V-8 transversely behind the rear seats. With 550 horsepower on tap, reducing the chances of oversteer by moving the engine inward seems reasonable. If, like us, you are now lusting for a modern Tucker, we have bad news for you. Rob Ida can build a new Tucker, but you still can’t buy one. Not really. The SEMA car is already sold. Ida won’t share the sale price, but he admits it’s less than the million-plus it takes to get an original. Of course, this is not the part of a regular series production. For Ida, the Tucker is a passion project. If you call his shop and ask him to build one, he’ll probably say no. Which is not to say that Ida is done with Tucker. Far from it. 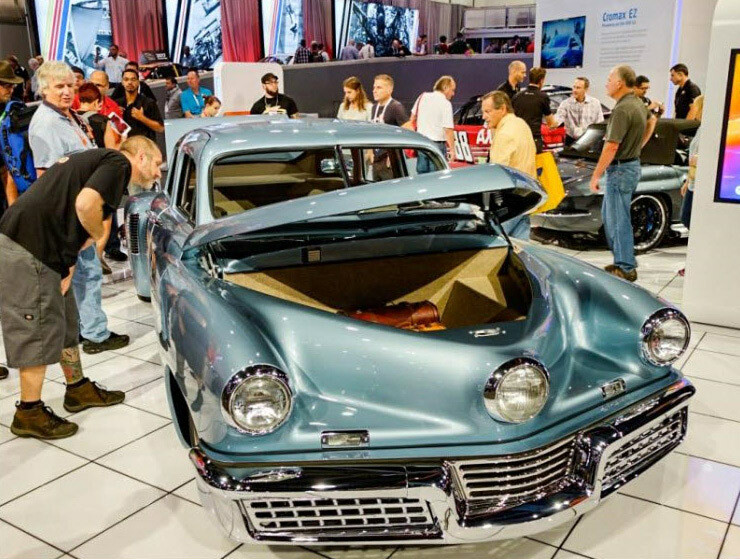 His next project is to make a real-life version of the Tucker Torpedo, Preston Tucker’s first concept that was never built, also with the help of Sean and Mike Tucker. He’s already built an aluminum body, based off a 3D scan of an original clay scale model. It’s the sort of thing that only comes about with right combination of skill, dedication, and resources. Fortunately for fans of the Tucker legend, Rob Ida has all three. SEMA photos courtesy of Matt Lewis.